Q. Were Hanuman, Surgriva etc. monkeys? A. They were human beings and they belonged to the hill and jungle tribes of south India who were called Vanara. Even now, we have people with surnames of Naga (snake) in Bengal, Bhalla (bear) in Punjab and Singh (lion) in northen India. People of the Vanara tribe in South India used to tie a rope around their waists. Many learned warriors like Hanuman and Sugriva belonged to this tribe. 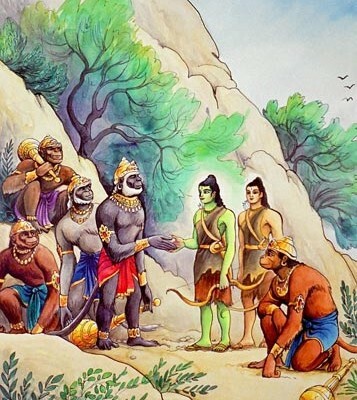 Monkeys do not speak or read scriptures of fight wars.These Vanara heroes have been described as monkeys only in a legendary form in epics and not literally. To call Hanuman – a great general, a celibate from birth and a philanthropist – monkey is an insult to the Indian heritage. One Response to Q. Were Hanuman, Surgriva etc. monkeys? Highly appreciable the research work done on this topic. Some saintly scholars have also done research on Ram, Krishan, Ganesh, Shiv ji. Even on the life stories of Krishan, Ganesh, they have tried to put the case, showing spiritual path shown by them instead of Orthodox point of view. Arya Samaj Org. should work, to remove the Orthodox point of view, put forth the spiritual and scientific point of view. How we can lean from their lives. So far a section of militant Arya Samajis are busy in using abusive language and arm twisting methods like against the spiritual symbols, enjoying tearing their photos, disturbing any puja being performed by their worshipers. They need to educated by Arya Samaj Org. They cause much harm to Arya Samaj and devide Hindu Community as whole. Their actions only generate hate against Arya Samaj.